In this report, the global market is segmented across many levels, namely, market by types, technology, and end users. The market by types consists of various chromatography accessories, namely, columns and column accessories, autosamplers and autosampler accessories, flow management accessories and consumables, fittings and tubings, detectors, mobile phase accessories, fraction collectors, and pressure regulators. Based on technology, the market is segmented into liquid chromatography (LC) and gas chromatography (GC) accessories and consumables. The liquid chromatography accessories and consumables segment is further divided into high pressure liquid chromatography (HPLC), ultra high pressure liquid chromatography (UHPLC), flash chromatography, and low pressure liquid chromatography (LPLC). The market demands significant investments in R&D in order to constantly come up with new and innovative products and technologies. Hence, majority of the players in this market compete against each other in order to enhance their market shares with continuous investments towards innovation and constant up-gradation of their product portfolios. Currently, all the major players in this market are focusing on increasing their presence in high-growth markets across emerging countries in Asia-Pacific, such as China, India, South Korea, Taiwan, Hong Kong, and Singapore. These markets offer an array of opportunities for growth and are expected to be the new revenue pockets for the global market. Majority of the demand in this market is driven by the growing demand for chromatography procedures in the life sciences, biotechnology, chemicals, pesticide, food and beverage, and other similar industries. Furthermore, growth in government investments in the APAC biomedical industry is one of the key factors propelling the growth of the market in the APAC region. The autosampler accessories and consumables market, which consists of vials, autosampler syringes/sample needles, and septa, is the fastest-growing segment in the chromatography accessories and consumables market. Vials account for the largest share in this market. In this segment, innovations in terms of variety of materials used for manufacturing as well as designing the equipment are expected to drive the growth of this market in the forecast period. However, the economic slowdown across the globe has resulted in a decrease in sales of chromatography systems, thereby affecting the sales of chromatography accessories. Decreased credit ratings and the continued debt crisis, particularly in European countries, have also adversely affected the flow of funding for R&D activities in the life sciences, biotechnology, and pharmaceutical sectors. This in turn has led to lower investments in research equipment, thus leading to lower than expected growth in the global market during the forecast period (2013 to 2018). In recent years, chromatography techniques have witnessed a large number of technological advancements, due to which new and advanced products are being launched in the market. The global market is valued at $2,621.4 million in 2013 and is expected to reach $3,458.6 million by 2018, at a CAGR of 5.7%. The market is broadly classified based on types of accessories and consumables, technology, end users, and geography. The market by types is further divided into columns, column accessories and consumables, autosamplers, autosampler accessories and consumables, flow management accessories and consumables, chromatography fittings and tubings, detectors, mobile phase accessories and consumables, fraction collectors, pressure regulators, and other products. The global market, by technology, is segmented into liquid chromatography, gas chromatography, and others. Liquid chromatography is further segmented into high pressure liquid chromatography (HPLC), ultra high pressure liquid chromatography (UHPLC), low pressure liquid chromatography (LPLC), flash chromatography, and others. Liquid chromatography accessories and consumables account for the largest share of 65.8% of the global market in 2013. The major factor driving the growth of the market is the growth in the global biotechnology and pharmaceutical industries. These industries are the prime users of chromatography techniques. Government bodies have extended their help in the form of investments, funds, and grants, which has stimulated the usage of advanced chromatographic techniques in these industries. Furthermore, research activities in the fields of medicine, proteomics, metabolomics, and genomics that use chromatography techniques are also driving the growth of this market. Apart from this, various factors such as, innovations, new product launches, and the growing number of chromatography conferences and seminars that create awareness about new technologies, are also propelling the growth of this market. However, economic slowdown across the globe has resulted in the reduction in sales of chromatography systems, thereby affecting the sales of chromatography accessories and consumables. Decreased credit ratings and continued debt crisis, particularly in European countries, restrains the growth of this market. Economic slowdown in the U.S. and Europe is significantly affecting the flow of funding for R&D activities in the life sciences, biotechnology, and pharmaceutical sectors. The global market is dominated by North America, followed by Europe, Asia-Pacific, and Rest of the World (RoW). 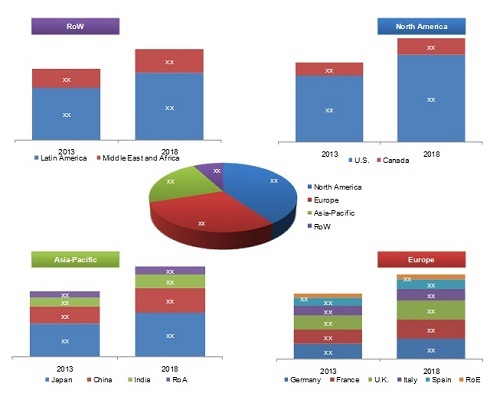 North America will continue to lead the global chromatography accessories and consumables market in the forecast period, followed by Europe, Asia-Pacific, and Rest of the World (RoW). The market is saturated in developed regions; hence, growth in this market is mainly driven by developing countries. Over the next five years, the growth of the global market in the Asian region is likely to be centered at Malaysia, Russia, Vietnam, China, Japan, Singapore, and India. This growth will be driven by factors such as the growing demand for chromatography procedures in the life sciences, biotechnology, chemicals, pesticide, food and beverage, and other similar industries; geographic expansion of major chromatography players in regional markets; extensive crop research; and increased government investments in the biomedical industry. Major players in the market include Agilent Technologies, Inc. (U.S.), Waters Corporation (U.S.), PerkinElmer, Inc. (U.S.), Thermo Fisher Scientific, Inc. (U.S.), Shimadzu Corporation (Japan), GE Healthcare (U.K.), Sigma-Aldrich Corporation (U.S.), and Bio-Rad Laboratories, Inc. (U.S.). Some of the other significant players in the chromatography accessories market include W.R. Grace & Co. (U.S.), JASCO, Inc. (U.S.), Phenomenex, Inc. (U.S.), Hamilton Company (U.S.), SRI Instruments (U.S.), Knauer GmbH (Germany), Konik Group (Spain), Macherey-Nagel GmbH & Co KG (Germany), and Restek Corporation (U.S.), among others. 9.13 SGE Analytical Science Pty Ltd.
9.18 W.R. Grace & Co.
*Details on Financials, Products & Services, Key Financials, Strategy, and Developments Might Not Be Captured in Case of Unlisted Companies.